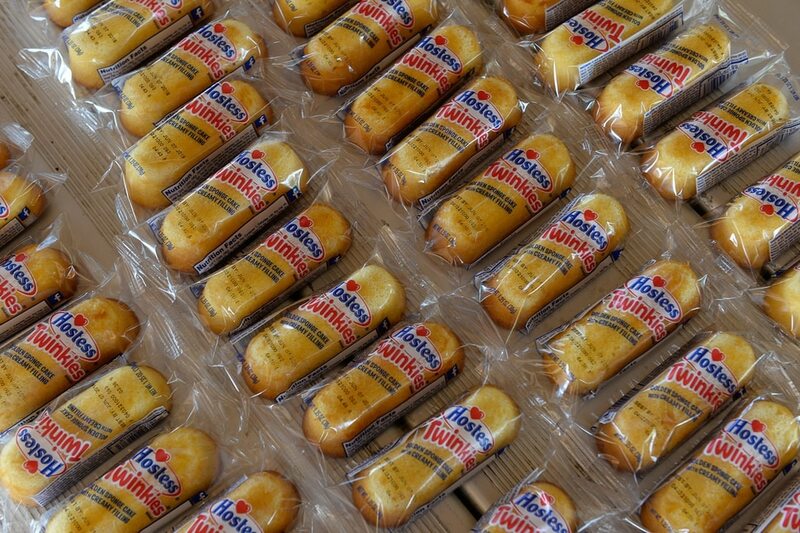 (Francisco Kjolseth | The Salt Lake Tribune) Described as senate candidate Mitt Romney's favorite on the road snack, Twinkies are lined up for those attending Mondays With Mitt at Veterans Memorial Park in West Jordan on Monday, June 18, 2018, where Romney visited with supporters. 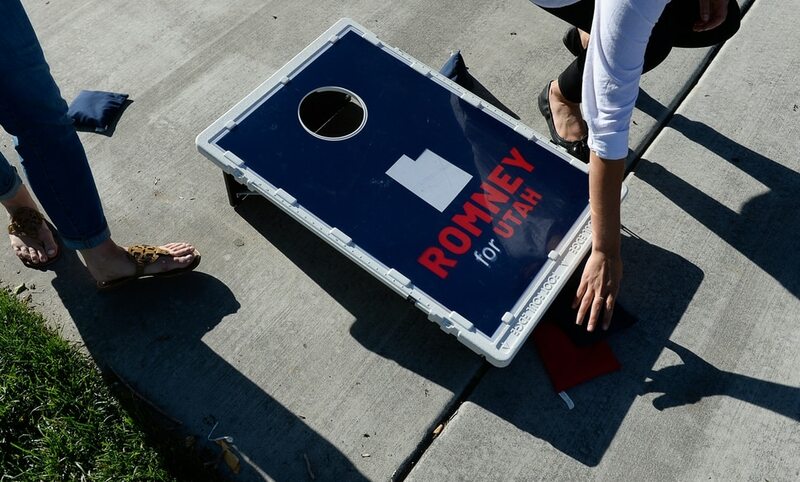 (Francisco Kjolseth | The Salt Lake Tribune) The Romney campaign hosts Mondays With Mitt at Veterans Memorial Park in West Jordan on Monday, June 18, 2018, as supporters play a friendly game of bean bag toss before the arrival of Senate candidate Mitt Romney with supporters at the park. . (Francisco Kjolseth | The Salt Lake Tribune) The Romney campaign hosts Mondays With Mitt at Veterans Memorial Park in West Jordan on Monday, June 18, 2018 as senate candidate Mitt Romney visits with supporters and takes a few questions with the dozens gathered at the park. (Francisco Kjolseth | The Salt Lake Tribune) The Romney campaign hosts Mondays With Mitt at Veterans Memorial Park in West Jordan on Monday, June 18, 2018 as senate candidate Mitt Romney visits with supporters and takes a few questions with the dozens gathered at the park. (Francisco Kjolseth | The Salt Lake Tribune) The Romney campaign hosts Mondays With Mitt at Veterans Memorial Park in West Jordan on Monday, June 18, 2018 as senate candidate Mitt Romney visits with supporters and takes a few questions with the dozens gathered at the park. (Francisco Kjolseth | The Salt Lake Tribune) The Romney campaign hosts Mondays With Mitt at Veterans Memorial Park in West Jordan on Monday, June 18, 2018 as senate candidate Mitt Romney visits with supporters and takes a few questions with the dozens gathered at the park. (Francisco Kjolseth | The Salt Lake Tribune) The Romney campaign hosts Mondays With Mitt at Veterans Memorial Park in West Jordan on Monday, June 18, 2018 as senate candidate Mitt Romney visits with supporters and takes a few questions with the dozens gathered at the park. . (Francisco Kjolseth | The Salt Lake Tribune) The Romney campaign hosts Mondays With Mitt at Veterans Memorial Park in West Jordan on Monday, June 18, 2018, as Senate candidate Mitt Romney visits with supporters and takes a few questions from the dozens gathered at the park. (Francisco Kjolseth | The Salt Lake Tribune) The Romney campaign hosts Mondays With Mitt at Veterans Memorial Park in West Jordan on Monday, June 18, 2018 as senate candidate Mitt Romney visits with supporters and takes a few questions with the dozens gathered at the park. 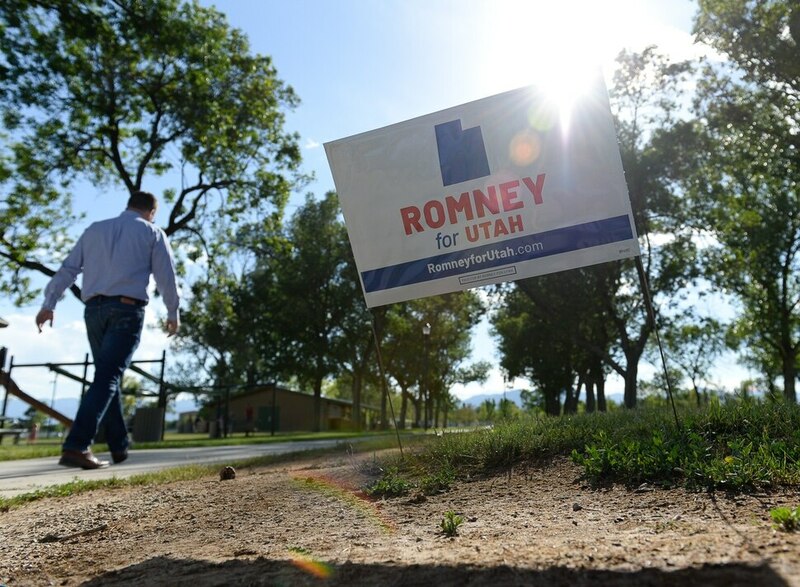 (Francisco Kjolseth | The Salt Lake Tribune) The Romney campaign hosts Mondays With Mitt at Veterans Memorial Park in West Jordan on Monday, June 18, 2018 as senate candidate Mitt Romney speaks with Chris Hoskins of Provo and other supporters gathered at the park. (Francisco Kjolseth | The Salt Lake Tribune) U.S. Senate candidate Mitt Romney arrives for Mondays With Mitt at Veterans Memorial Park in West Jordan on Monday, June 18, 2018, to speak with supporters. (Francisco Kjolseth | The Salt Lake Tribune) The Romney campaign hosts Mondays With Mitt at Veterans Memorial Park in West Jordan on Monday, June 18, 2018 as senate candidate Mitt Romney visits with supporters and takes a few questions with the dozens gathered at the park. (Francisco Kjolseth | The Salt Lake Tribune) Give-away pens are lined up as the Romney campaign hosts Mondays With Mitt at Veterans Memorial Park in West Jordan on Monday, June 18, 2018 as Senate candidate Mitt Romney visits with supporters and takes a few questions from the dozens gathered at the park. (Francisco Kjolseth | The Salt Lake Tribune) The Romney campaign hosts Mondays With Mitt at Veterans Memorial Park in West Jordan on Monday, June 18, 2018 as senate candidate Mitt Romney visits with supporters and takes a few questions with the dozens gathered at the park. (Francisco Kjolseth | The Salt Lake Tribune) Young kids play with flags as their parents attend Mondays With Mitt at Veterans Memorial Park in West Jordan on Monday, June 18, 2018 where Senate candidate Mitt Romney visits with supporters and takes a few questions. (Francisco Kjolseth | The Salt Lake Tribune) Lining up shirts to give away, the Romney campaign hosts Mondays With Mitt at Veterans Memorial Park in West Jordan on Monday, June 18, 2018 as Senate candidate Mitt Romney visits with supporters and takes a few questions from the dozens gathered at the park. West Jordan • The special counsel’s investigation into Russian interference in the 2016 presidential campaign should be allowed to reach its conclusion, Mitt Romney said Monday, downplaying claims of a “witch hunt” by President Donald Trump and his supporters. “No one is above the law,” said Romney, a Republican candidate for U.S. Senate in Utah and his party’s 2012 presidential nominee, referring to indictments that have already been produced by special counsel Robert Mueller’s team. The front-runner in Utah’s primary race said everybody hopes to see the investigation completed “sooner rather than later,” but some comparable probes have lasted years. Romney gave The Salt Lake Tribune an interview at Jim’s Family Restaurant after a campaign stop at a West Jordan park, during which he talked to a crowd of roughly 100 residents about the need to pay down the national debt and bolster state oversight of what are currently federal programs. He stumped for just under a half-hour while campaign staff handed out free T-shirts and Hostess Twinkies. Many who attended Monday’s event had already submitted their mail-in ballots and said their support for Romney predated his formal candidacy, for some it went as far back as the 2002 Winter Olympics. David DiFrancesco said he was “elated” when Romney announced he was running for Senate, and there was essentially no question since then how he’d cast his vote. With one week remaining before the state’s June 26 primary election, Romney said he was “cautiously optimistic” about his odds of defeating Utah Rep. Mike Kennedy, R-Alpine, for the Republican nomination. The campaign had made several stops before reaching West Jordan’s Veterans Memorial Park, and Romney said he planned to keep campaigning until all the ballots were counted. “Every day we get around to as many places as will see me,” he said. Kennedy’s campaign declined an interview request Tuesday, the latest in a string of unsuccessful attempts by The Tribune to speak with the candidate. His campaign was also provided with written questions but did not respond. Romney on Monday declined to comment on Trump’s proposal to create a Space Force, a new branch of the military. The topic was too new, Romney said, and he had not yet considered his position. He did weigh in on the Trump administration’s controversial “zero-tolerance” immigration policy, which has exacerbated the number of family separations at the border and prompted bipartisan backlash in reaction to stories, images and audio of migrant children in cages. The administration should cease the practice of separating families at the border, Romney said, while Congress works on long-term immigration solutions. He spoke favorably of a proposal by Sen. Ted Cruz, R-Texas, that would facilitate the detention of intact families but said he had reviewed only a summary and was not in a position to fully endorse Cruz’s plan. Romney reiterated a desire to balance the federal budget and pay down the nation’s debt. He told guests at his West Jordan event that “new promises” need to be made to younger and middle-age Americans regarding entitlements, including raising the retirement age and consolidating support for those with the greatest need. In recent weeks, Romney’s campaign has run TV ads in which the candidate describes himself as a “deficit hawk.” He supports the overhaul of the federal tax code, he said, despite forecasts that its cuts to individual and corporate tax rates could add as much as $1 trillion to the annual deficit. Romney said he preferred cutting the corporate rate to 25 percent, instead of the 21 percent rate ultimately adopted by Republican majorities in the House and Senate. But had he been a senator during the vote, with a choice between a corporate rate of 35 percent and 21 percent, Romney said he would have supported the changes. Asked if that positions him for potential compromise should Democrats gain control of the Senate in 2019 or the White House in 2021, Romney said it’s unlikely Congress will vote on more tax changes in the near future.